URSULA BIEMANN, ISABELLE HAYEUR, MICHELLE CLAIRE GEVINT, NEW MINERAL COLLECTIVE (TANYA BUSSE AND EMILIJA SKARNULYTE), SARA TIRELLI, FIONA TAN. ‘The Impossibility of an Island’ brings together a selection of artists’ films addressing the human-made planetary destruction through geographically distant stories, deeply connected by two major liquid forces: oil and water. One narrative addresses the rising level of planetary waters that is quickly erasing lands and coastlines, forcing entire communities to migrate, as well as the destructive consequences of plastic and other debris drifting throughout the ocean’s surface. The second addresses the issue of fossil fuels, whose massive extraction is running geology backwards by bringing a substance to the surface, that took the planet millions of years to bury, and whose combustion is reinserting polluting elements into the atmosphere at unprecedented speed. Oil and water as liquid forces equally connect and divide peoples and territories on the physical, economical and social level. They set the basis of modern narratives of conquest and colonization, and ultimately shape the intangible battlefield of a struggle for the increasingly scarce resources on the planet. 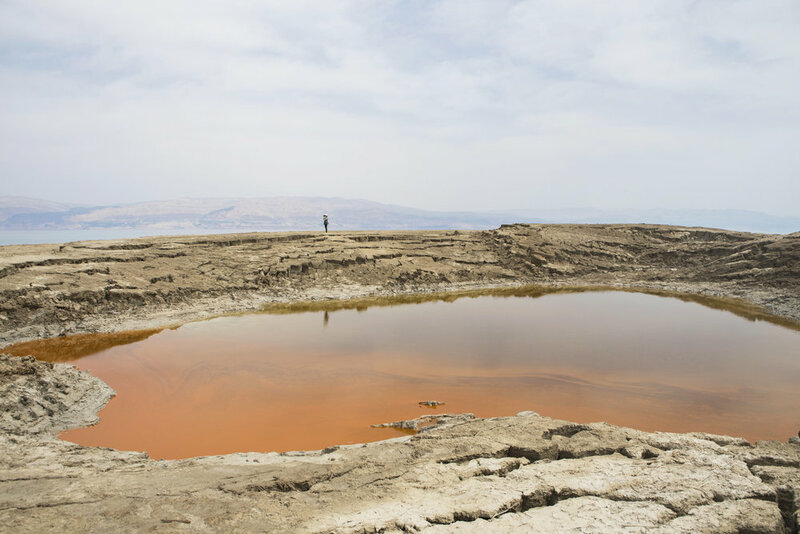 On the outskirts of Dead Sea in Israel a recent geological phenomenon is forming called sinkholes which are exponentially ‘swallowing’ man made habitats due to rapid evaporation, climate change and human intervention. Although extremely dangerous and unpredictable, there is much beauty in these pools of green, orange and blue liquid which resemble Martian landscape and have been a mysterious source for new microbial life in an ecosystem infamously known for its barren characteristics. The voice over is based on an interview conducted with a geologist who was ‘swallowed’ by a sinkhole. Spending hours inside a cavity in the earth, he went through psychological extremes from hope to despair. The film blends documentary, historical essay and fictional elements by merging the resonances of a mythical fable with apocalyptic elements that seem like fragments of dreams and hallucinations. It invites us to examine human interaction with nature and the way in which nature reclaims itself through powerful and transformative natural disasters. Hollow Earth (2014) is a visual meditation and examination of contemporary resource conditions within the circumpolar areas of the North. Combining research material, landscape shots and archival footage, this short film hopes to reflect over the changing image of the north, as a site where violence, desire, greed, and emotions are played out. 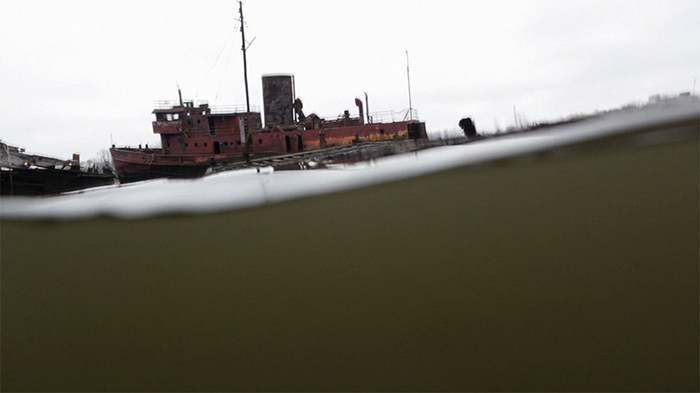 "Castaway" was filmed in the murky waters of Witte’s Marine Salvage at Staten Island (New York). The largest boat cemetery on the Eastern Seaboard, this uncanny, desolate place is the final resting place of numerous wrecks of all varieties and several eras : ferries, barges, fishing boats, even old steam tugs. Their hulks slowly rot away in the mud of Arthur Kill, a refinery-lined inlet still busy with tankers. Located near New Jersey’s Chemical Coast and the former Fresh Kills landfill, these now toxic shores, originally home to salt marshes, forests and freshwater wetlands, have seen their share of ecological disasters. This behind-the-scenes look at industrial development, revealing its hidden side : its dark underbelly, may offer a glimpse of an unsustainable capitalist economy’s eventual shipwreck. Oil and water are taken as the two ur-liquids that form the undercurrents of all narrations as they are activating profound changes in the planetary ecology. The video draws a connection between the relentless reach for fossil resources that will continue its toxic impact on the climate, and the consequences this has for broad indigenous populations in remote parts of the world. Melting Himalayan ice fields, rising planetary sea levels and extreme weather events increasingly define the amphibian lifestyle imposed on the Bangladeshi population. The video documents the gigantic community effort in building protective mud embankments. Hands on work by thousands without any mechanic help is what climate change will mean for most people in the Deltas of the global south. These are the measures taken by populations who progressively have to live on water when large parts of Bangla will be submerged and water is declared the territory of citizenship. News from the Near Future contains a number of key elements in the work of Fiona Tan: it explores memory and the passing of time through the use of black and white archival footage acquired from the Amsterdam Filmmuseum and tinted in order to create an almost painterly texture. The recurrent motif is water. The viewer is met by the sea, on which all kinds of boats--from small yachts to much bigger steamships--sail. Its waves washing the seashore, landscapes with huge waterfalls, and the disasters that leave floods in their wake remind us of the ambivalent relationship between man and nature. Cassandra develops my artistic investigation about the concept of crisis understood as dynamic of rupture that unleashes chaos. It is a dystopian vision of the city of Venice.The main character, Cassandra, appears as survivor, witness and prophet, moving on a fragile boat on a wasted lagoon, blaming the disaster that has finally destroyed the city. Her words (taken from the poem A Soliloquy for Cassandra by Wislawa Szymborska) are juxtaposed and remixed with scientific data illustrating how the transit of cruise ships and the increasing pollution in the area have impacted the lagoon and poisoned the citizens to a point of no-return. Shot in 16 mm, the video uses the aesthetics of “found footage” to blur the perception of time, evoking the idea of Venice as a city of future past, in which the present contains both traces of the past and visions for the future. This ultimately leaves space for hope that measures can still be taken to avoid the catastrophe, turning Cassandra’s lament into an urgent, desperate cry for love and action.